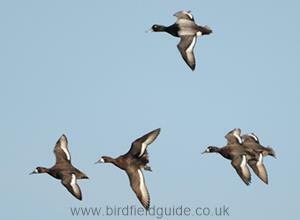 Male and Female Scaup in flight, note the light grey back on the Male bird and the white blaze on the females. The Male Scaup in Winter has a dark green-black head and neck, white flanks and a pale grey back. It's tail is black and it's bill is blue-grey with a small black tip. It has a distintive yellow eye. 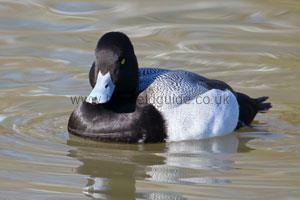 The Scaup is a very rare and irregular breeder in the UK and favours the North of Europe. 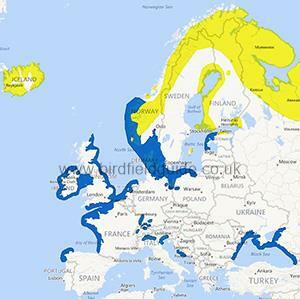 In winter it is more common with around 7000 birds recorded around the coastline, especially in the North Sea. 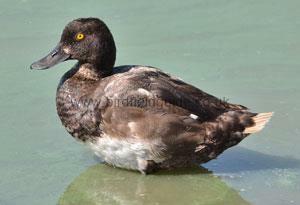 Also known as the Greater Scaup, the Scaup is a heavy looking diving duck. The Scaup is primarily a sea duck but during the winter, especially in rough weather, it can often be found feeding in freshwater pools near the sea. The Scaup breeds on remote moors and tundra mostly in Scandinavia. The Male Scaup in Summer is a much browner bird, it's back is a more subtle grey, it's flanks are brown and it's head is black-brown. Note the distinctive yellow eye. Note the distinctive blue-grey bill on this Male Scaup, the grey back differentiates it from a Tufted duck. 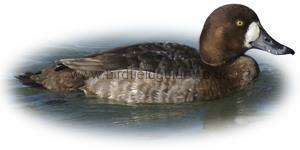 The Female Scaup is mostly greyish brown, it's flanks are usually lighter and more grey. The Female always has a distinctive white blaze on it's face. 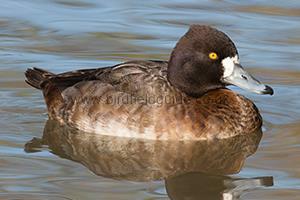 Note the white blaze and yellow eye of this female Scaup. The flanks usually appear lighter that the rest of the birds body and this Female has a dark brown head indicating she is in Winter plumage, it would be lighter brown in Summer.